You have to try our Perfect Instant Pot Chicken Broth! You will never go back to store bought. After a 5 days of my girls both requesting a can of chicken noodle soup in a thermos for lunch (bleech) I decided to try a homemade version. I knew that I could make homemade chicken broth pretty quickly in the Instant Pot but I had no idea how delicious it would be with a few personal tweaks. It is amazing! 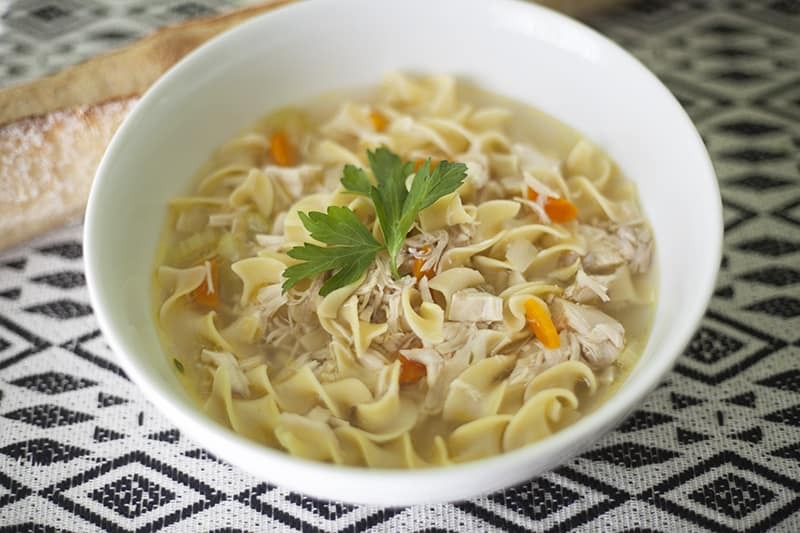 I start with this broth recipe and make a batch of the Best Chicken Noodle Soup Recipe once a week. I’ve even started eating it for breakfast. We are all addicted! With the help of an Electric Pressure Cooker, Perfect Instant Pot Chicken Broth from scratch doesn’t have to be an all day affair. 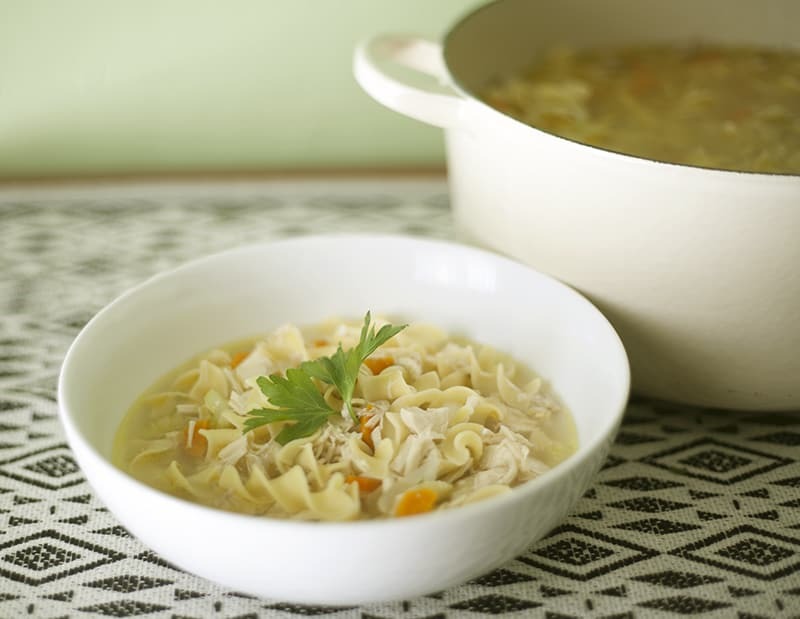 The key to a great Chicken Noodle Soup is the broth. 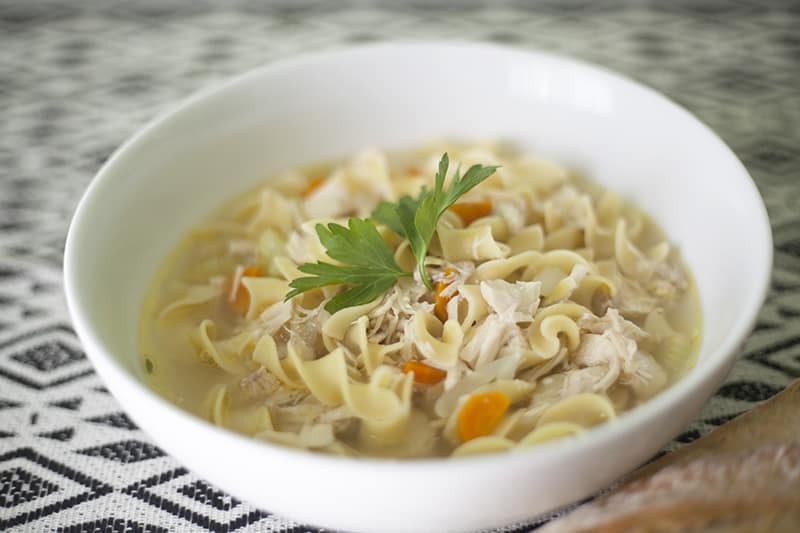 This recipe not only gives you a delicious base for your soup (or whatever your plan is for the broth) but also gives you a whole chicken’s worth of meat to add to the soup. Add all ingredients to instant pot and seal according to manufacturer’s directions. Cook on high pressure for 25 minutes. Both quick release and natural release work fine. Strain all of the ingredients out of the broth, reserving the chicken. The broth can be used right away, stored in the fridge for a week, or frozen for later. If you would like to try more Popular Instant Pot Recipes, check out our Perfect Instant Pot Chicken Broth which is a great base for homemade chicken noodle soup, Easiest Instant Pot Apple Compote Recipe is a hot and wholesome autumn breakfast, Instant Pot Garlic Pork & Kale Recipe is a savory and delicious dinner full of flavor, Instant Pot Korean Ribs: Pressure Cooker Baby Back Ribs that you will dream about, Instant Pot Pasta Bolognese: One-Pot Penne with Meat Sauce and Instant Pot Penne Vodka Recipe are two pasta dishes that will become regular weeknight staples. What is your favorite Instant Pot recipe?